A few years ago, Clifford & I decided we wanted to take charge of our health and really look at the quality of products we were eating. We also knew we couldn’t afford to buy premium beef all the time on our budget. Since we already had the cows, we decided to grow one out and then butcher for our own use. When I talked with the butcher about the process, they gave me these random ‘cut sheets’ with a lot of gibberish on them and told me to bring it filled out when we dropped off the beef. Let me tell you about panic! What in the world was I getting myself into?!? During this process, I’ve learned a lot about the different cuts of meat and how to best utilize the process to make it work for US. 1. Know what types of meat you usually use. We mainly use ground beef and roast, so I wasn’t too worried about getting a lot of steaks. We’ll eat them occasionally, but it’s not what we eat on a regular basis. A friend of mine purchased a half cow for her family & after a year she had all these roasts in her freezer and didn’t know what to do! Her family loves to eat steak and they grill burgers pretty regularly but never eat a roast. Another friend bought the other half cow and she ended up with a ton of steaks in her freezer! Luckily, they know each other, so they did a swap of steaks for roasts. Unfortunately, that’s not always the case. The moral of the story – really analyze what types of beef you use and make sure to focus on those. 2. Be willing to try something new. Before we butchered our first cow, I’d never heard of Short Ribs. We’d asked for the ‘standard’ cut list, so we got a bit of everything. There were these packages in the freezer just sitting there with the words ‘short ribs’ and I had no idea what to do with them. Luckily, Google came to the rescue. I found a recipe for some Asian short ribs and cooked them in the InstantPot and they were AWESOME! There are so many ways to make short ribs (broiled, stewed) and they’re all good. Every time we send another cow to the butcher, I make sure to snag a few packages of these to put in our freezer. Some other cuts I’ve learned to love are liver, flank steak, and sirloin. 3. Determine how much freezer space you have. A full cow can be over 400 pounds of beef and it can take up a lot of space, depending on how it’s packaged. For the most part, a full cow with broth bones will take up two large igloo coolers. We’ve found an upright freezer works best, but that’s mainly because it’s easier to find things. If you have all ground beef or just a few cuts, then a chest freezer would work. 4. Paper or Plastic? Most butchers will double wrap the cuts with plastic wrap then and cover that with white butcher paper. As long as it has that 1st layer of plastic wrap, the meat will last 12-15 months without getting freezer burn. Another option is to always get it vacuum sealed. Since it’s airtight, the meat will last 18-24 months in the freezer. 5. Size matters. Part of the process is to tell the butcher how big to cut your steaks, how large of roasts you need, and how much for the ground beef packages. We normally cut our steaks at 1” thick, roasts around 3 pounds, and put the ground beef into 1-pound packages. We also put 4 burger patties in a 1-pound package. Most of this is just our preference as I don’t normally cook more than 1 pound of beef at a time. Others have larger families, so they want the larger roasts or their ground beef in 1.5 or 2-pound packages. As you can see, customizing your beef to fit how YOU will use it makes a lot of sense and it’s not THAT confusing! These are just a few of the tips I’ve learned while buying our beef in bulk as well as walking others through the process. I hope this helps demystify the process a little! 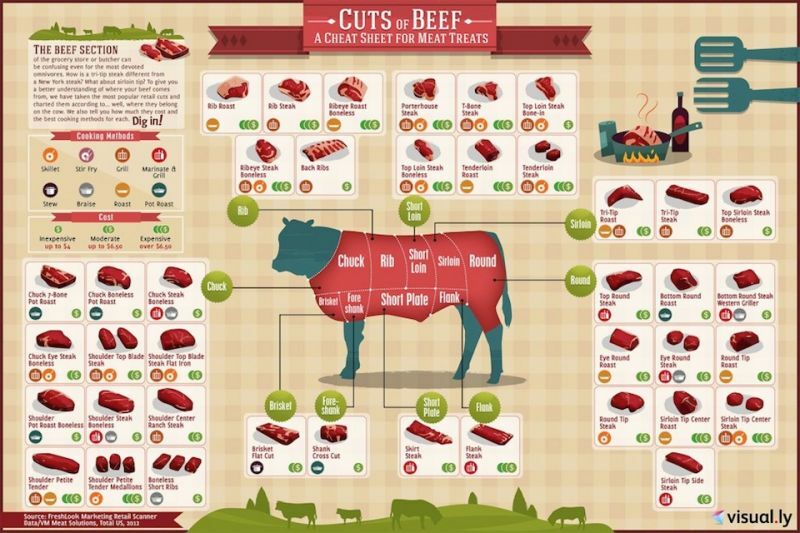 Let me know if there’s anything else you’ve learned or wondered about buying beef in bulk.